The basic principle of resistance heating is that, when current passes through some resistance, power loss takes place which appears in the form of heat. There are two types of resistance heating namely, direct resistance heating and indirect resistance heating. In the direct resistance heating, electric current passes through the charge itself. This current produces I2R losses in the form of heat within the body itself. This principle is made use in heating water by means of electrode boiler. 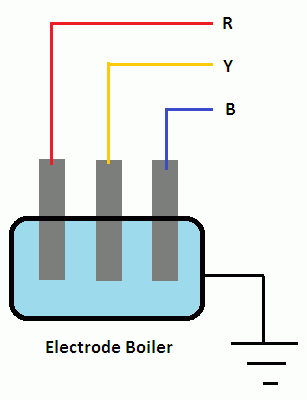 In the case of electrode boiler, the electrodes are lowered into the tank filled with water. The current flows through electrodes into the water and water gets heated by I2R losses. For temperatures up to 100°C, mild steel electrodes are used. The automatic stirring action is produced in the charge to be heated and no external method of stirring is required to get uniform heating. In the indirect resistance heating, the current does not flow through the body to be heated but it flows through the resistance elements which get heated up. The heat is then transferred from the heating element to the charge mainly by radiation or convection. 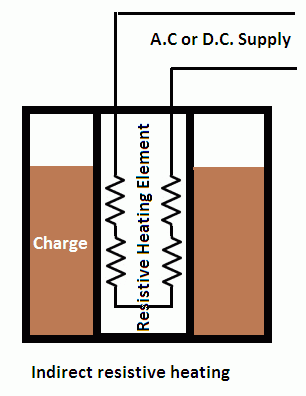 The figure shows a simple sketch of indirect resistance heating oven. In this method heat does not pass through the charge, hence natural stirring action is not there. So some external stirring apparatus are employed to get uniform heating in indirect resistance heating method. The appliances that work on this principle include immersion rod, electric kettles, electric iron etc. Use of variable Number of Elements. In this method, the number of heating elements in working is changed, so total power input is changed. Change of Connections: In this method, the elements are arranged to be connected either in series or in parallel or combination of both in star or in the delta by means of switches at different instants according to the requirements. Transformer Tappings. The voltage across the oven can be controlled by changing the transformer tappings. This can be done by stepping down the supply voltage to the ovens. This is the economical method for voltage control. Moreover, in this method, automatic temperature control is done by thermostatic control. Very accurate heat control can be obtained by SCRs. Thermostat control circuit: This is used in the automatic heating appliances to control the temperature. It is connected in series with the resistance element. It is made of a bimetallic strip. A bimetallic strip consists of two strips of different metals having the different coefficient of expansions, securely fastened together. When the thermostat is connected in series with the resistance element current starts flowing through the thermostat, bimetallic strip starts bending. After some time contact point, A shown in figure opens and the current flowing through the resistance element stops. Now no current is flowing through the circuit, bi-metallic strip starts cooling, bi-metallic strip regains its original shape and hence contact point A closes. Thus, thermostat controls heating of element by making and breaking the circuit again and again. A screw is provided in thermostat, which varies the tension between the two strips and hence varies the making and breaking time of the contact point A. High resistivity: It should have high specific resistance so that small quantity of wire is required to produce a certain amount of heat. The low-temperature coefficient of resistance: The resistance heating element material should possess the low-temperature coefficient of resistance, so that resistance may not vary with the change in temperature. High melting point: The melting point of the material used should be very high so that high temperature can be obtained. Free from oxidation: It should be free from oxidation to ensure a long life of the heating element. Most commonly material used for the heating element is either alloy of nickel and chromium or the alloy of nickel, chromium and iron. These are used for temperatures up to 1100oC. The composition of the alloy for resistance heating elements depends upon the working temperature. For higher temperatures silicon carbide, tungsten and graphite are used. Eureka is a copper-nickel alloy approximately 56% copper and 44% nickel. It is used where the low-temperature coefficient is required, such as in instrument coils, shunts, etc. Thanks for reading about direct resistance heating and indirect resistance heating. 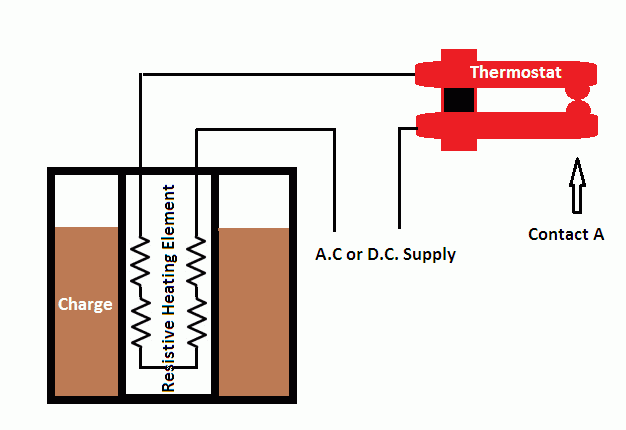 © http://www.yourelectricalguide.com/ direct resistance heating and indirect resistance heating.